How to choose a suitable hook? Under normal circumstances, small fish hooks can only catch small fish, big fish hooks can catch big fish, but some fish have larger mouths, so you need to use big hooks. Therefore, before selecting the hook, you can refer to the size of the hook to get the hook that is really suitable for you, and reduce the escape of the fish. 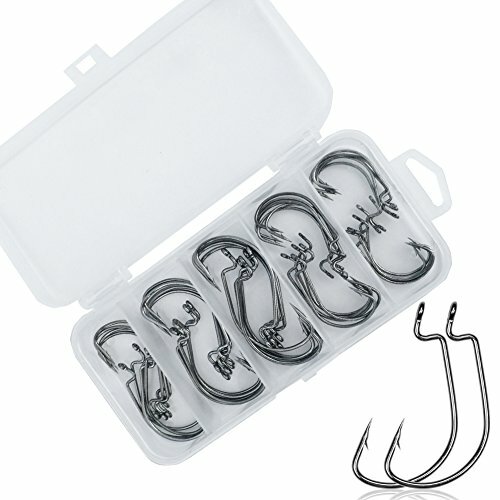 We have a variety of sizes of hooks for you to choose from. Size 5: 60pcs, Size 6: 60pcs, Size 7: 60pcs, Size 8: 60pcs, Size 9: 60pcs, Size 10: 40pcs, Size 11: 40pcs, Size 12: 40pcs, Size 13: 40pcs, Size 14: 40pcs. Box size (L*W*H): about 5.12 in x 2.56 in x 0.9 in. Size 2: 10pcs, Size 1: 10pcs, Size 1/0: 10pcs, Size 2/0: 10pcs, Size 3/0: 10pcs. Box size (L*W*H): about 5 in x 2.36 in x 0.9 in. Drasry Fishing Hooks are Made out of high carbon steel, with high strength and corrosion resistance. makes it a great choice for the freshwater and saltwater anglers. durable in use. The fishing hooks are design with special barb hooks and really sharp,for less mortality rate. They are packaged in a transparent plastic box for keeping the different sizes separated and easy to access.